As you may have noticed over the past couple of months our website has been undergoing quite a few changes. We have completely renovated its look, making it more modern and more importantly, we have made it easier to use. We have introduced a lot of new features including an, ‘About Us’ section, which provides all the information you need to know about Jones, from our many years of experience to how we can help your business. We have also created a latest updates and blog feature; all of these give you the ultimate insight in to our products and will help you guide you through using our products too. The latest news section can be found on the home page of the website, here you will find lots of great articles about new products and any new developments from existing products. We want to keep you up to date with any new and exciting information and also help you become more familiar with our products, so you’ll never miss a thing. As well as the latest news, we now have a blog feature, so if you find yourself with 5 minutes to spare and fancy something to read, our brand new blog has everything industry related, from the latest trends to we have been up to here at Jones. Along with the new features to our website, you can now connect with us across all of our social media platforms, where you can get the latest product images, updates and information all at your fingertips. The layout of the website is now more dynamic, making it easier to navigate to and from each page and it has now become a platform in which you can view our entire catalogue of product ranges, including our own products and branded products too. We have introduced a search bar at the top of the page; this allows you to search for any collection using key words. We have also developed a drop down filter when searching collections, making it easier to search for specific items simply by selecting a colour, product name or product type, saving you time and effort when you have a specific product in mind. It can also be handy when showing our products to a customer, as all the images are there with the product names clearly displayed. To make our website easier for our customers we have collated all of our collections together in one place, all with the latest images. Whereas before you could only view one item from that collection, we have now developed it so that you can view every tieback within a collection as well as the matching trims, to help you complete the look. We have done the same for all poles and curtains tracks both our own and branded products, making it easier for you to navigate around a collection and browse with ease. 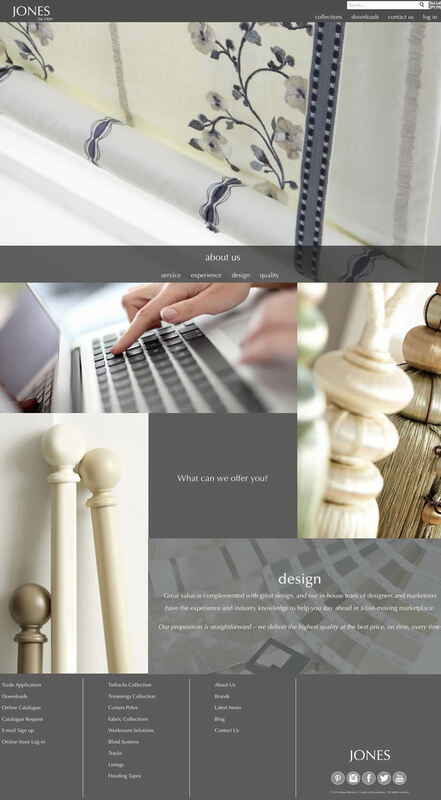 We wanted to create a completely interactive platform, to make viewing our products and keeping in touch much simpler. We have made it easier than ever to apply for an account with us via the application form, and to submit your made to measure orders through our online interactive forms, all of the information is there, you just need to tell us what you want and how you want it simply by filling in the clearly marked boxes on the form and it submits directly to our sales office who are ready to process your order. We also have complete, downloadable versions of our catalogues and leaflets which can be accessed and viewed on any device, so don’t worry if you have nipped out without the catalogue, it can be saved to your device to view whenever you need it, or if you think you have lost it, you can now request a new one at the touch of a button. We know that many of our customers are extremely busy, often without time to stop, so we have made it even easier to order our products on the go. With our online ordering system, Webtex, you can now place your orders anytime, giving you more time to spend doing what you do best. The website has become a great platform in which to expand our brand digitally and has become the main hub for linking all of our social media channels and our online ordering system. This new easy to use website will enable you to browse through our products more efficiently than ever, and with the easy link to our online store, shopping online with Jones has never been simpler. We will continue to develop and improve all aspects of our digital sites to create an enjoyable and relaxing shopping experience.